Updates at 10:10 pm today: Latest updates from Mirror Newspapers “As it emerges one of the 227 passengers was using stolen Italian passport”, HERE. 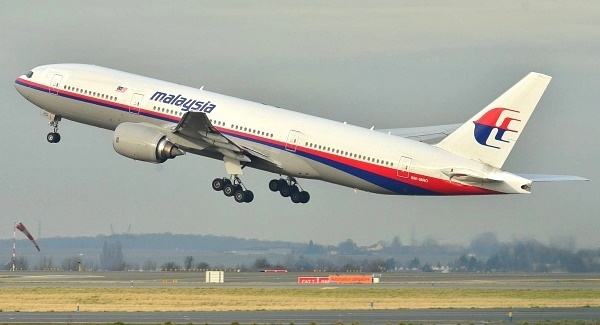 Updates at 6:30 pm today: On 16-9-2012 there was a comment from a reader, GE Man, who has stated: “4) On 9 Aug 2012, MAS B777 Registration 9M-MRL, in Shanghai Airport, MAS B777 ‘s right hand wing clipped the left elevator of Chine Eastern A340 during taxi out. Very bad damage and now still in Shanghai Airport, being repaired by BOEING team.” in a posting “Azhari cares to provide answers for the “technical problem?”. En Azhari Dahlan should be able to shed some light whether the above comment was true and that whether it is the same aircraft as MH370 that is believed to have crashed. Updates at 2:20 pm today: MAS is still unable to confirm what has been reported by Yahoo News that MAS MH370 has crashed into the ocean. As at 12:37 pm today, Tuoi Tre, a leading daily in Vietnam, reports that the Vietnamese Navy has confirmed the plane crashed into the ocean. According to Navy Admiral Ngo Van Phat, Commander of the Region 5, military radar recorded that the plane crashed into the sea at a location 153 miles South of Phu Quoc Island. For full report read HERE. Lets us offer our thoughts and prayers for all the 239 passengers and crews of MH 370. In in the interim, MAS is doing all it can to contact the next of kin of the passengers in HERE. Aircraft has many backup systems in case of system failure or emergency. An aircraft could not disappear as what have been reported so far. One major question in the minds of the public is: How could the crews did not even have the time to call Air Traffic Control (ATC) to declare emergency? The top management of MAS will have to address this when the dust has settled. Previous Are the MCA leaders aware of the “Api Dalam Sekam” in The Star? Just a question, is the head of engineering department qualified? What do you expect from the Bo(otak) head? MAS needs to appoint a foreign consultant firm to help him. may be no need, he already got the pariah to consult and take instructions. Heads in MAS must roll after this matter has been confirmed. My prayers to the victims and families of the plane crashed. Unfortunately, Saudara Wee, there are conflicting reports on what the Vietnam Navy has reported on the fate of this aircraft. Whatever, this is very serious and the sudden loss of radio contact could well suggest sabotage (a bomb), missile strike, powerful explosion on board (such a fuel explosion) or a sudden rupture of the fuselage due to in-flight decompression caused by structural failure or negligence, perhaps due to an improperly closed cargo hold door. Structural failure plagued the British Comet jet airliners, the world’s first, with two sudden fuselage breakups in the air in 1954 with loss of all passengers. The cabins of modern jet airliners today are pressurised or passengers would die when it’s flying at typical crusing altitudes (heights) of say 10,000 to 12,000 metres at which jet airliners fly today and this constant pressurisation when flying and non pressurisation when on the ground causes the fuselage skin to stretch a bit, like a balloon in flight and return to normal on the ground. In the case of the Comet, this repeated pressurisation/non-pressurisation cycle eventually caused the metal fuselage skin to tear at altitude and pop like a balloon when pricked. Lessons from the in-flight rupture of the Comet fuselage due to cabin pressure were resolved with the American Boeing 707 and later jet airliners, and certainly with the Boeng 777. This would point to some other cause of in-flight explosion which would explain the sudden loss of contact. If it was engine failure, fire, or something else, the pilot would have had time to radio distress but in this case, the pilot apparently had no time. Whatever, I fear the worst. actually it didnt crash but it had been sabotage since the issues between ukraine and russia still on conflict. proof is one of the passenger is a russian while the other one is ukrainian. so, that was the point. The plane in the picture above is a Boeing 737, not a Boeing 777 like MH370. Thank you for the alert. I have changed the photograph of the aircraft. I hope that it is the correct aircraft this time. Once again thank you and have a pleasant weekend. hi why don’t we looking for forest and high mountain area. they lived happy lives…. did they?